If he had his way, President Rodrigo Duterte said he would not hit the campaign trail this year to pitch for his senatorial bets in the May elections. Duterte is wary of being accused of using government resources to give his preferred candidates an unfair advantage. “The Cabinet members sinabi ko sa kanila, though the law allows you to campaign just like the President, but I would insist na huwag kayong makialam. 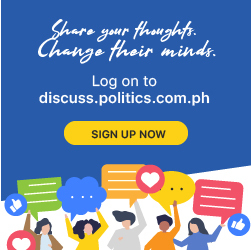 Because not only would they bring so many issues with them, pati na ‘yung sabihin ninyo na ginamit ‘yung gasolina, ginamit ‘yung sakyan ng gobyerno, ‘yung eroplano,” said Duterte. “ So just to do away with those issues and to make it really equal for all, nobody uses government property or funds because that is not allowed by law,” he added. But Duterte said “utang na loob” or debt of gratitude has compelled him to break his stand for incumbent government officials not to participate in the partisan campaign. “I will be campaigning for those people napagkautangan ko ng loob…I’m not bragging but rather I’m saying that if ever I campaign for anybody, it’s gonna be a very, very limited activity. Not only because — I don’t know about you but mabigat kasi sa amin ‘yan, ang utang na loob,” said Duterte in a speech. “ I said though I am predisposed to campaign, kokonti lang naman ho ang tao na papasalamatan ko. In Luzon, it could be Imee Marcos, then Abet Antonio of Bataan. Those were the only guys who showed an interest to see me as President,” said Duterte. “Sa Visayas po where I come from, Cebu, wala ho akong utang na loob doon except ho ‘yung mga first cousins ko. But all others in that hometown of my father, I never had any leader. Manila, wala. Ni wala ako isang barangay,” he added.